Dandelion leaf on sale at the market. Around Christmas time I had a conversation with a couple of people at the market about dandelion leaf. Apparently the Christmas and New Year period is the time you forage for it. And you eat the root too. The leaf is made into salad and the root goes into soup. The window when the dandelion is young, tender and not too bitter is very short. Once it starts to flower at the end of winter or early spring it is way too late. It is believed to be a tonic, refreshing the blood after winter in preparation for spring. To my surprise, at the first market after the New Year, the big fruit and veg stall from Le Blanc had dandelion leaf for sale. 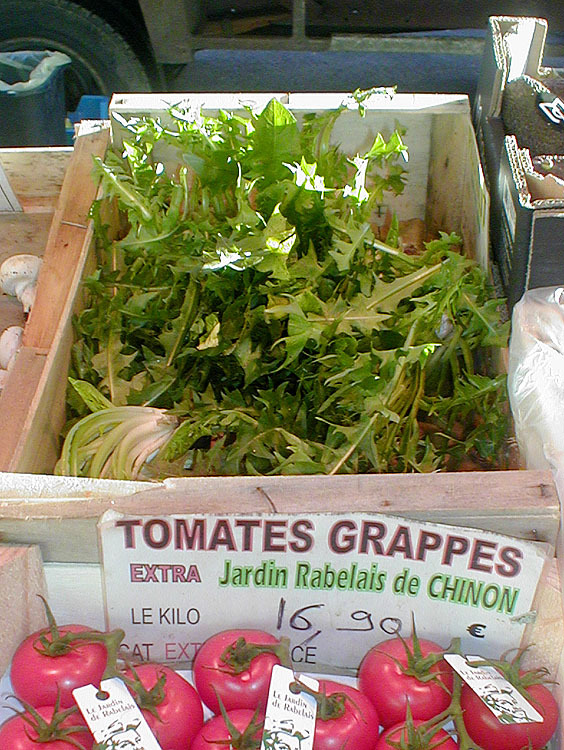 I posted on Facebook about it and received the following response from someone who used to live further west in the Loire Valley: "A friend used to collect them for salad...with lardons, croutons made from dry bread rubbed with garlic and a vinaigrette. He said that his mother used to grow them in her garden as his father liked the salad, but she used to earth them up to reduce the bitterness." By the way, if you are intrigued by the beautiful tomatoes below the dandelion, and/or horrified by their price, you may like to check out this blog post about a rather special producer. Beware of eating too much.... it isn't known as Pissenlit for nothing. One of our allotment neighbours tried to grow some... his germinated very poorly, and the few that survived, didn't for long!! Also he had difficulty telling the "weed" from the "commercial"!! I was going to say the same as Tim that dandelion is also a diuretic in France because of its name pissenlit which means pee in bed! I don't know if dent de lion, lion's tooth, has the same effect in English speaking countries! Yes. I forgot to mention it was a diuretic.